Music’s ability to bring people together is one of the reasons that makes the Levitt Pavilions and Remo partnership a great fit. “Remo’s really thrilled to be working with Levitt Pavilions. The Levitt mission statement of creating community through music has such a great power for society and resonates with Remo’s own mission,” says Fitzgerald. While Remo may best be known as a percussion and drum company, it has a deep commitment to improving communities through music as well as an involvement with music as a wellness tool. In Remo-funded medical research, drum circle participation was proven to boost the immune system through increased Natural Killer cells (the white blood cells that target cancer and other viral cells). The company’s HealthRhythms program promotes drum circles as a wellness practice, and Remo itself develops instruments that allow those with sound-sensitivities like the autistic community and those suffering from post-traumatic stress disorder to benefit from drum circles. There are three shows left on the Remo-sponsored tour: tonight (June 27) at Levitt Pasadena, Saturday, June 28 at Levitt Los Angeles and Wednesday, July 2 at the future Levitt Denver site. All events will have a pre-show drum circle led by a drum facilitator who creates an atmosphere of creativity, play and community. While you can bring your own percussive instrument if you have one, we’ll also be providing instruments—free Remo Sound Shapes—to the first 250 participants. Click here for more information on the Remo- and NEA-sponsored Levitt National Tour featuring Playing For Change. Thank you for including me in this awesome community event. Pasadena was the place to be for musical expression and music appreciation. The people were awesome-the staff were awesome Remo USA was key in bringing everyone together to drum as one. I was so happy to facilitate sush a great community rhythm event. Let’s do it again soon!!! 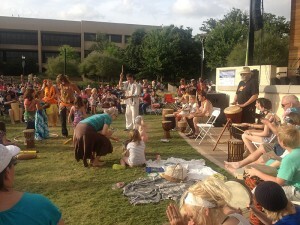 Freedom Drum Circles is dedicated to building community spirit for all people of all walks in life.